There have been a number of instances of burglaries where “cylinder snapping” (also known as or “lock snapping” and “lock bumping”) in the Horsham area. This is a very method used by burglars to break into property that has a euro cylinder found in most UPVC doors. It is being used because snapping is a method of attack which requires no specialist tools or knowledge. The best way to prevent this method of entry is to install a lock with a break-secure cylinder. 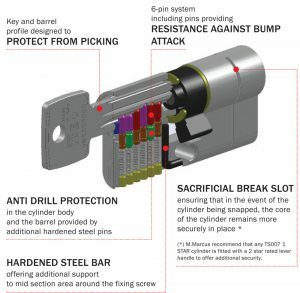 A break-secure cylinder has been designed that although it will snap, it will snap in a predetermined position leaving intact a portion of the cylinder that will still provide security and still require key operation to open, thus preventing the easy manipulating of the locking system. If you would like to know about break-secure locks call Adrian on 01403 261466.